The decision by Salina (Okla.) Highbanks Speedway to re-configure its NASCAR Whelen All-American Series this year is paying off in the early running for Jeran Frailey. Frailey won the NASCAR Division II championship at Salina last year in the 360 Modified Division. The dirt modified cars were so abundant that track officials elevated them to NASCAR Division I this year. Frailey, 31, of Chouteau, Okla., has collected three wins and seven top fives in seven races to take the lead in the track and state point races. He is ranked 27th in this week’s NASCAR Whelen All-American Series Top 500. In the national point race, Anthony Anders of Easley, S.C., did not race over the weekend due to rain and track schedules but retained the No. 1 ranking with 518 points. Second-place Dillon Bassett of Winston-Salem, N.C., (402 points) closed ground with a third-place finish behind race winner Austin McDaniel in a 100-lap late model feature at Hickory (N.C.) Motor Speedway. 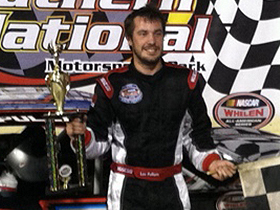 Lee Pulliam advanced to third from fourth in national standings with a pair of wins in 75-lap Late Model features at Southern National Motorsports Park in Kenly, N.C. Pulliam, of Alton, Va., is the series’ two-time defending national champion and has 388 points. Tommy Lemons Jr. of Troy, N.C., dropped to fourth in points by posting finishes of fourth and 14th in the races Pulliam won. Matt Bowling of Ridgeway, Va., maintained fifth in national standings. Peyton Sellers, the series’ 2005 national champion and Trey Gibson remain steady at fifth and sixth-place in standings respectively and did not compete. Pavement SK Modified driver Keith Rocco, the series’ 2010 national champion, jumped five positions from 13th to eighth this week. He had a second-place finish to Kyle James at Waterford (Conn.) Speedbowl in his only start of the weekend. With Rocco’s entry to the top 10, Randy Porter and Brandon Fox dropped one position each to rank ninth and 10th respectively. In addition to the national championship race, NASCAR will crown champions across 28 U.S. states and three Canadian provinces. Frailey’s dad Randy, 54, and cousin Jacoby, 17, are among the current Salina Highbanks and state point leaders as well. Randy won Saturday night’s feature over Jeran in Saturday night’s 20-lap feature. Other Frailey Motorsports drivers on track this year include Jeran’s wife Randi and Jonathon Beyer. The Frailey family has been involved with dirt track racing for more than three decades beginning with Randy Frailey and his late brother, Allen. The Salina track had been idle for several years and reopened with NASCAR sanction in 2011. New ownership cleaned the place up and added their own improvements. Salina quickly became a Saturday night racing and entertainment destination. “It’s one of the best tracks I’ve been to,” Frailey said. “The racing surface and the overall facility is one of the best. It’s always nicely kept. It’s the place to be on weekends. It’s what everybody in Chouteau does on Saturday nights. It’s a fun deal. Frailey said Salina’s 360 Modified division feature fields are between 18 and 20 cars. As its name implies, the track is steeply banked. “You carry a lot of momentum around the track,” Frailey said. “That’s what makes it so fun to race on and it’s plenty wide. It’s versatile as far as where you can pass. We generally enter the corners on the high-side, dive low and make a pass coming off the corners. You kind of diamond it off. Frailey and wife Randi have a six-year-old daughter, Bobbie Joe, who test-drove a quarter-midget on asphalt in April. The Frailey cars share a single team operated by the Frailey Company. Mike Mack is the chassis builder and crew chief. Team members include Nick Jenson Jeremiah Smith, and Shane Underwood. The cars use Jeff’s Performance Engines of Sherman, Texas. The Frailey family owns and operates Frailey Salvage in Chouteau and Frailey’s Recycling with locations in Tulsa and Turley, Okla., and Texas. The NASCAR point structure in Divisions I-V has been adjusted slightly for 2014. Drivers receive two points for every car they finish ahead of in an event, up to 18 cars. Three bonus points will be awarded to a race winner with a single-digit starting position and five bonus points will be awarded to a race winner with a double-digit starting position. At season’s end, the NASCAR Whelen All-American Series Division I Top 500 drivers will be ranked by their best 18 NASCAR point race finishes in series-sanctioned events. The points season concludes Sept. 21. Drivers must be NASCAR-licensed and cars will be verified for display of required series sponsor decals to be eligible for NASCAR points and awards. Lee Pulliam had two wins and gained ground.